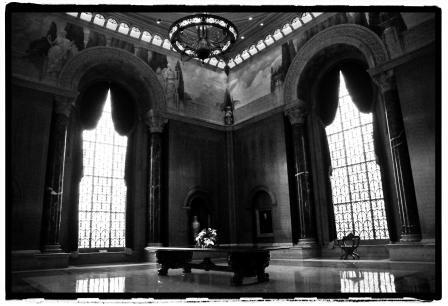 Shortly after construction of the Armstrong Browning Library, reports began circulating about a loitering ghost near the first-floor elevator. The spirit belongs to Preacher Johnson, who died in a tragic mishap when a malfunctioning elevator crashed during the library’s construction. He is referred to by some simply as Preacher. On occasion, people claim he pushes elevator buttons and disrupts the temperatures (typically producing cold spots) near the elevator doors, the very location where he died. Often, when things are misplaced or found on the floor in the library, Preacher takes the blame. The legends and folktales in Cotton Bales, Goatmen & Witches: Legends from the Heart of Texas, compiled by Bradley T. Turner and accompanied by photographs from Mark Burdine, bring to life the whispered stories and forgotten secrets that illuminate the darkest recesses of the Texas psyche from the distant past to the present day. Order today from Amazon or Barnes & Noble!